Carl Frampton believes a loss to Nonito Donaire could spell the end of his career. 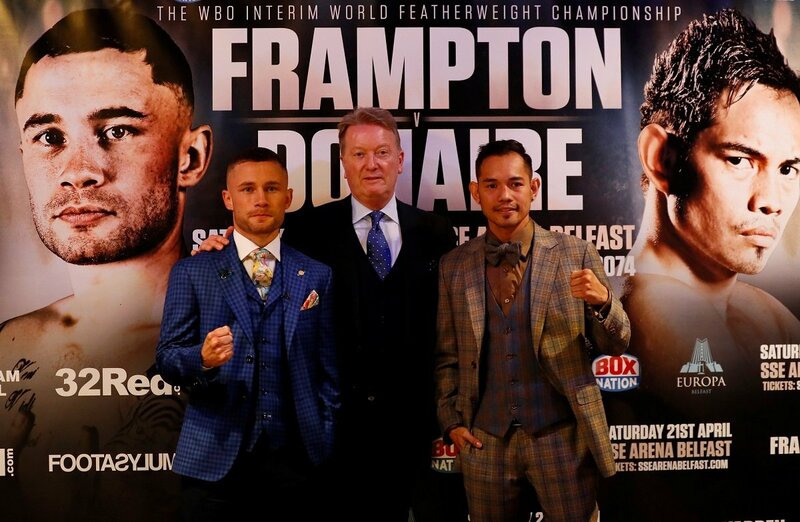 31-year-old Frampton, who has just one loss on his record in 25 fights, is looking to become a world champion again like the highly-respected Donaire and believes that a loss could mean the end for one of them. “Look at what he’s done in the ring and what’s he achieved. What I’ve done has been overshadowed by what he’s done. He’s a quality fighter and achieved a hell of a lot,” Frampton told iFL TV. “He’s dangerous because I think we’re in a similar position maybe – last chance saloon – where a loss could be the end. I’m not thinking about that. “I’ve done everything that’s been asked of me in training camp and I feel like it’s been a quality one,” he said. Ulsterman Frampton also feels people are underestimating Donaire ahead of the fight but has insisted that he certainly isn’t one of them. “I get the impression people are writing Donaire off [thinking he’s past it]. I’m not writing him off and that’s the important thing. I don’t think I can get carried away with that too much,” said Frampton. “I’m preparing for the best Nonito Donaire there’s ever been. It’s been a long training camp. He’s had time to prepare and is a solid professional. “I’m sure he’s done everything that’s asked of him in training like me. It’s going to be a good night,” he said. Though he is aware that he must first get past the major test that ‘The Filipino Flash’ will set him this weekend, Frampton could potentially win the interim WBO belt and be set to face world champion Oscar Valdez next up. “Valdez would be an unreal fight – it would be nothing but fireworks. That fight appeals to me at the minute,” he said. “Leo Santa Cruz is fighting in June so that rules him out for an August fight. Hopefully we can do the third one at some point,” Frampton said. Saturday’s massive evening of boxing also features WBO bantamweight champion Zolani Tete making the second defence of his title after his world record-breaking KO win in November against the experienced Argentine Omar Andres Narvaez. BoxNation is available on Sky/ Freeview/Virgin/ TalkTalk/ EE/Apple TV/ online at watch.boxnation.com, via apps (iOS, Android, Amazon) and TV Player for just £12 a month. Buy now at boxnation.com. Carl Frampton and Nonito Donaire took questions from the media at today’s press conference at the Europa Hotel ahead of their clash for the WBO Interim Featherweight World Title at Belfast’s SSE Arena this Saturday, broadcast live on BT Sport and BoxNation. Below are a selection of quotes from both fighters and promoter Frank Warren. “To have a guy like Nonito Donaire coming Belfast to fight me almost feels like an honour. In terms of accolades, he’s accomplished more than anyone I’ve fought, that includes Leo Santa Cruz. He’s a future Hall of Famer and hopefully I can put my name in that bracket one day. “Some people want the easiest fights, but that’s not me and I don’t think that’s Nonito either. I’m experienced enough to know that I need to be in fights that excite me and get me nervous. “I think the crowd adds something to my performance. There isn’t an atmosphere like the SSE Arena anywhere in the World! “Me and my wife feel like we are married to Carl! We wake up, we see Carl. We go to bed, we see Carl. He’s a great fighter. “I think I have been gifted with great genes. I feel like I’m entering my peak because of my positive mentality. I’m smarter now and I’ve learned with the ups and downs of my career in the past couple of years. We are very confident going into this fight. “In some ways this is a crossroads fight for the both of them. Both guys know what they want. Winning the Interim title will get them a shot at the WBO Champion Oscar Valdez. This is a tough fight for Carl. Nonito has been boxing since the age of eleven and we’ve heard that he’s had a brilliant camp. “It’s a pleasure and a joy to be back in Belfast, especially promoting such a great show involving so great Champions. There is no comparison anywhere else. This is what boxing is all about, the best fighting the best. We’re in for a special treat this weekend. “The Belfast public are knowledgeable boxing fans and they appreciate good fights, we’ve got plenty of 50/50 match-ups right down the card and I can’t wait for Saturday. There’s some great Irish derbies on the card and we’ve also got knockout king Zolani Tete defending his WBO Bantamweight crown against Omar Andres Narvaez. Carl Frampton and Nonito Donaire, along with fighters on the undercard, will perform public workouts at the Victoria Square Shopping Centre in Belfast from 1.00pm onwards.